In a span of two months, I have made 3 cot size quilts. One for my piano teacher's baby girl, one for my neighbour's grandson, and one for my DH's granddaughter from his first family. 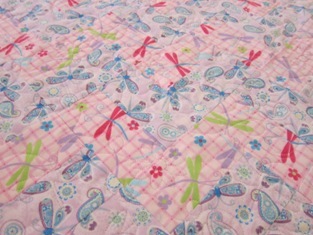 I enjoyed the process of making each of the blankets, and was certainly keeping very busy. I made this quilt top out of curiosity when I saw the free pattern published by AmandaJean. I'm one of the very many followers of her blog. I just happened to have the two slightly different patterns and colours of fabrics for the quilt top. I used some left over fabrics for the sashing, border and binding. 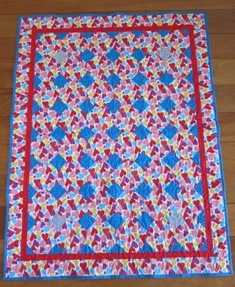 I quilted the quilt with the 'DragonFlyFlowers' quilting pattern shared in 2006 by the Statler Sisters Yahoo Group. It turned out quite nicely, I thought. My piano teacher loves dragonfly, so it was very well received. Before the arrival of baby Wil, I had this unfinished quilt top waiting around for some time as there wasn't enough motivation to finish it off. As soon as I have heard the happy news, it didn't take very long to complete the quilt. Again, I used some left over fabrics for the binding. 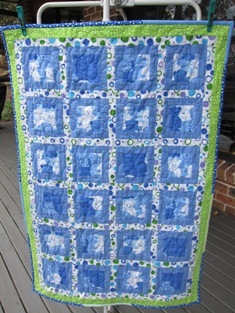 The 'baby bear' quilting pattern was by Kim Diamond, it came with my Gammill Statler. 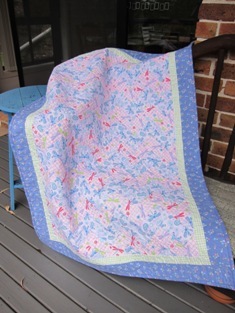 My wonderful neighbour couldn't thank me enough for the quilt. It was a very good indication, and I, of course, was very pleased. 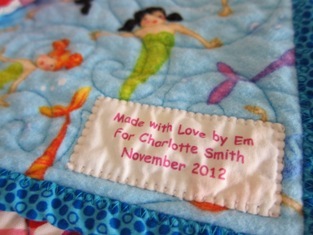 I started working on this quilt top when baby Charlotte was progressing well, after being born 7 week prematurely. There was a little bit of my DH's old shirt in the quilt top (squares near the corners). I found trying to match the points between blocks quite a challenge, but I was manging OK. 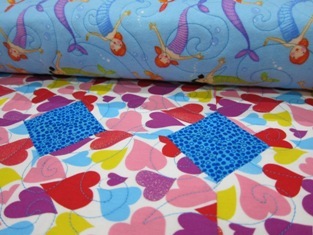 I have got the backing fabric with heart pattern to match the quilt top. 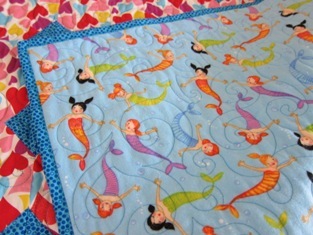 But seeing that the family lives next to the sea (Bondi Beach, Sydney), I have decided on the backing fabric with cute little mermaids, instead. 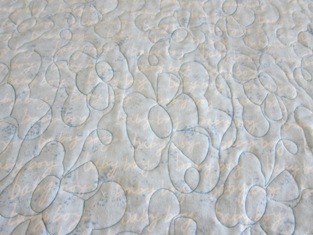 I chose the 'blowin in the wind e2e' quilting pattern by Tammy Finkler for the quilt. It looks like swirly ocean waves (to me, at least!). 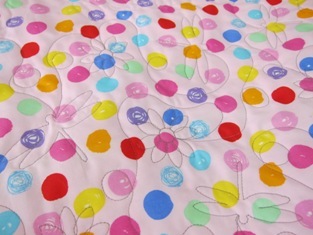 The quilt is now on its way to Bondi Beach.